Country Living at it's Best! 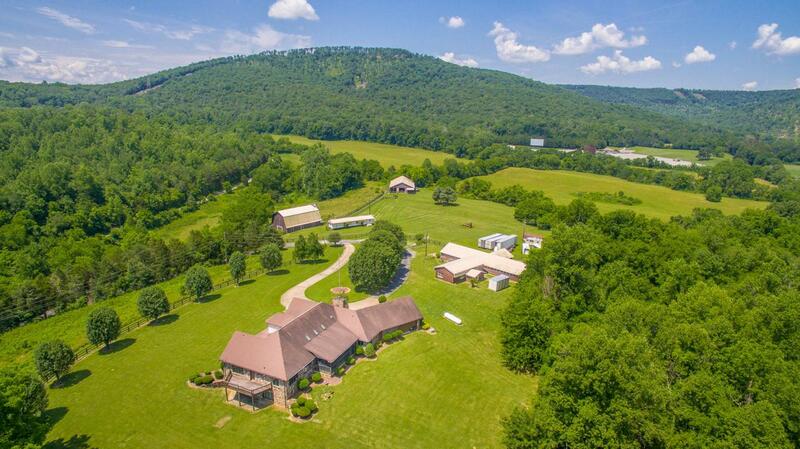 This 4 bedroom, 4 bath custom built home is situated on 20 private acres and is only 20 minutes to Downtown Chattanooga. No detail was overlooked and no upgrade omitted. Designed for both family living and yet set to host the largest of gatherings, this home fits any need and is designed to take in the mountain views from almost every room. Guests are welcomed into the great room that features 22 foot ceiling with sky lights and open floor plan. The dining room is perfect for entertaining. The living room features floor to ceiling windows . You can also open the doors to the screened in porch for even more space to entertain. The kitchen is spacious and has plenty of cabinet and counter space, dining area and a wall of windows overlooking Lookout MountainThe den/family room with stone fireplace is open to the kitchen which is perfect for family living. This side of the home has a guest bedroom, laundry room with full bath, and office/study with built in shelving that opens up to the screened in porch. On the opposite side of the home is the large master suite that has a private deck. The spa like master bath features separate vanities, jetted tub and separate shower. There are 2 additional good sized bedrooms, and full bath on the main level. Step downstairs to a large recreation room that has plenty of room for a pool table, media area, and would be the perfect "man cave"and a full bath. There is plenty of storage space with a 3 car garage. Relax and enjoy the views of Lookout Mountain and the hang glider park is within sight so you can watch the hang gliders soar off the mountain. There is tons of storage space with the outbuildings. The detached garage could easily fit 8 vehicles. The tool shed is huge and will hold mowing equipment and lots of tools. The main barn is HUGE . There is a old stone barn with 3 bays and a carport for even more storage space. This home has been meticulously maintained and is ready for new owners, make your appointment for your private showing today! SPECIAL FINANCING AVAILABLE ON THIS HOME COULD SAVE YOU APPROXIMATELY $8450 WITH THE ZERO PLUS LOAN, CONTACT AGENT FOR DETAILS.